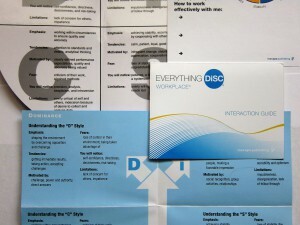 Why is it helpful to know someone’s DiSC® style? We make judgments about people as soon as we meet them. We can’t help it. 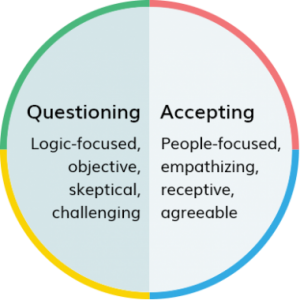 These assumptions help us communicate and relate to others. 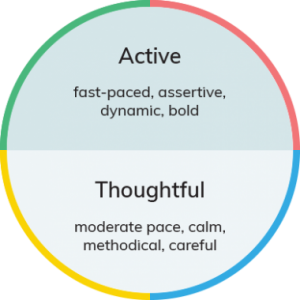 DiSC helps you make better-informed judgments that you can refine as you learn more about a person. Reading someone’s body language, noticing their pacing and listening for the types of questions they ask can all inform your reading of another. These initial hypotheses of style can help you provide better customer service or reduce someone’s stress. We expect others to pick up on our social signals. If I check the time, that probably means I want you to finish talking. If I act excited, I’d probably welcome you joining me in expressing delight. We naturally mirror the actions, dress, gestures, volume and tone of others in order to show our affiliation or support of them. Why not consciously use this one aspect of behavior to be a bit more persuasive and build rapport with others? While humans do love to speculate on the motives and desires of others, DiSC only addresses observable behavior. Perhaps the easiest one to observe is pace. Does he seem in a hurry, does she interrupt, is he direct or blunt? Then we can speculate that this person’s priorities put them in the northern quadrant of the DiSC circle. You have to listen and watch a bit more closely for the next pair of behaviors around agreeability. Does he act friendly almost immediately? Is she asking questions about who and how? Is he nodding or showing that he wants to welcome you or your ideas? Then we can assume this person is comfortable in the east quadrant of the DiSC circle. We are making assumptions. You can’t know one’s real style without an assessment. Sickness, stress, recent events, emotional intelligence, purpose and other things can influence the style you observe. For example, people who meet me at small group functions often think I’m expressive and enthusiastic. For that time period, with that group, I am. But those are the behaviors I choose to display at that time. We are all a collection of the four styles. People-reading is a first-step to understanding another. You still need to confirm assumptions. This is a way to begin a relationship, but to strengthen one you’ll need to work harder and explore much more.